I know, I know, I usually review fiction. But I’m also a homeschooler, and many among my readership also homeschool, so when I was contacted about this blog tour, I snatched up the opportunity. Tune in tomorrow for a 5-Q Interview with author, Karen Lange! 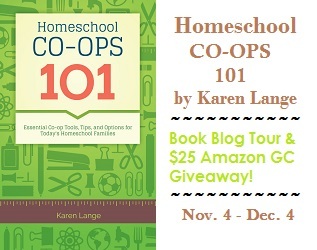 Karen is sponsoring a giveaway for one $25 Amazon gift certificate and one copy of Homeschool Co-ops 101. A winner will be announced on December 5, 2013. Here’s the details. Please use this Rafflecopter link to enter. Wishing you all the best with your books. Thanks again! You’re more than welcome, Karen. Your book looks like such a great resource. I’m glad to share it. I’ve seen Karen’s book on other sites. It sounds like an important tool for parents who home school. I thought the book may suggest how homeschool parents can join efforts for activities etc., but there is no mention. Guess the title Co-Ops made me think that. Actually, Pat, I think that’s the premise of the book. Section one especially seems to have the nuts and bolts for how to go about forming a group that does such activities together. Thanks so much for your comment! The book is about parents joining efforts for activities and supplemental learning, and discusses how families can get involved in and use community offerings as well. There are so many ways to supplement learning at home, resources are nearly endless! The book is also a good tool for other student groups as it provides foundational info for starting a group, as well as lesson and activity ideas for grades K-12. Well, there we go! Thanks, Karen. I’m going to give this post a few more nudges on social media, because I KNOW I have some followers who homeschool. Thanks, I also shared it so my homeschool friends can read it too. This book/guide might come in handy. Mom’s been thinking of homeschooling us. Thanks for stopping by! Wish you all the best wherever your studies take you! I didn’t know she was still considering it, Erik. I know you do great in school, but homeschool has opportunities all its own. Let me know if you guys decide to do it! Thank you so much for the great write up. Hope your readers find this book helpful! Thanks so much Diane! You have been a big help to me! Karen, I hope the rest of your tour gets a tremendous response. Best of luck!! That’s awesome, Susan! Thanks so much!